The Sims creator Will Wright plunges into the world of television with a new 30-minute episodic series called Bar Karma, a fueled by the creative power of its audience. Will Wright's television ambitions come into sharp focus today as Current TV reveals Bar Karma, a first of its kind television show that places the audience in control of production. Viewers registered at Current TV's Creation Studios website will submit their story ideas to the producers. Each week the producers will provide a rough outline for the next episode. The audience will be able to use tools provided via the website to create storyboards. Once the storyboards are submitted, viewers will browse and vote on the ideas submitted, merging them into final proposals which are then voted on again. One the final storyboard is selected, Hecht and Worldwide Biggies will create a 30-minute episode out of it. "Bar Karma is a culmination of over a year's work and I am very excited to see the results as we join together not only gamers and television viewers, but actually create a community that will be empowered with a professional production team," stated Will Wright. "To develop and lead an initiative like this fulfills a long held passion for television, and I am thrilled that Current would provide the resources and creative support to bring this to air." 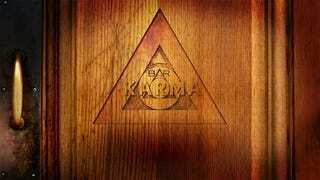 Bar Karma will premiere in the first quarter of 2011 on Current TV. Keep an eye on the website for more information in the coming weeks. I still wish it was called Sim TV Producer, but you can't win them all.